Copernicus Publications recently launched its full-text HTML workflow and optimized the CP website for mobile devices. Thereby, the user experience is significantly enhanced when reading CP articles. Marie-France Loutre has left the team of chief editors of CP, but will remain on the editorial board as a regular editor. Being an active player within CP leadership, the remaining chief editors are grateful to Marie-France for her friendship and her strong commitment over the last several years. Modelling will still be well represented as Uwe Mikolajewicz has joined the team of chief editors, alongside Marit-Solveig Seidenkrantz, Eric Wolff, and Denis-Didier Rousseau. From 1 January 2018 Climate of the Past (CP) will slightly increase the article processing charges. From Trump to Heinz, some of America?s most famous family names and brands trace their origins back to Germans who emigrated to the country in the 19th century. Researchers from the University of Freiburg have now found that climate was a major factor in driving migration from Southwest Germany to North America during the 19th century. The results are published today in CP. Volker Rath, who has been an editor of CP since it started, has decided to step down. He holds the title of CP's most prolific editor, having supervised the passage of at least 88 papers. The CP chief editors want to record huge thanks to him: it is the willingness of our editors to work on papers both within and around their field that enables the success of the journal. We are pleased to announce the names of two new chief editors for Climate of the Past. One vacancy arises because Nerilie Abram has been appointed as a coordinating lead author for chapter 1 of the IPCC SROCC. Congratulations to CP editor Hubertus Fischer who has won the 2017 Willi Dansgaard Award. He will receive the award at the AGU Fall meeting in New Orleans this December. Carlo Barbante has rotated off the team of chief editors of CP, but will remain on the editorial board as a regular editor. The remaining chief editors thank Carlo for his work over the last several years. Ice will still be well represented as Eric Wolff has rejoined the team of chief editors, alongside Nerilie Abram, Marie-France Loutre, and Denis-Didier Rousseau. In 2016, the 17 EGU?Copernicus peer-reviewed open-access journals experienced significant growth. We published over 3300 final-revised papers, corresponding to some 53,500 pages, a growth of about 10% compared to the previous year. These papers were downloaded over 645,000 times. The editorial board of Climate of the Past warmly congratulate Denis-Didier Rousseau on winning the EGU's Hans Oeschger Medal. 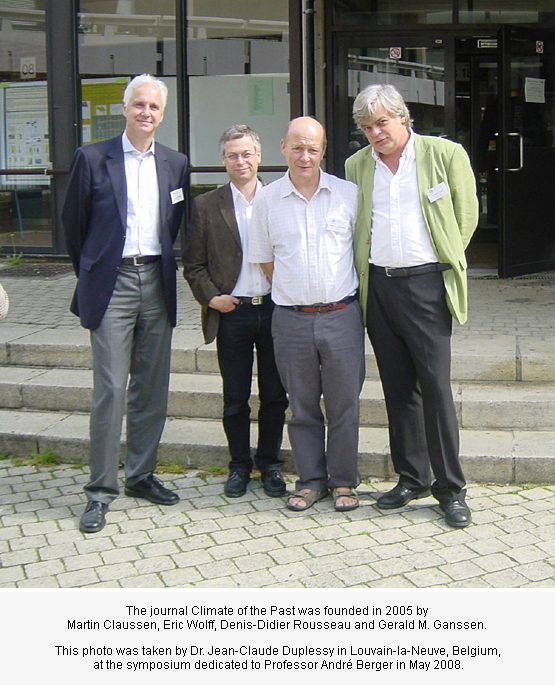 After 8 years as a co-chief editor of Climate of the Past, Thorsten Kiefer has stepped down from the editorial board. Please read CP's farewell letter. While searching through historical archives to find out more about the 15th-century climate of what is now Belgium, northern France, Luxembourg, and the Netherlands, Chantal Camenisch noticed that many of the 1430s' winters and some springs were extremely cold in the Low Countries, as well as in other parts of Europe.